Throughout the last week I have been completing my work experience at Hayle Heritage centre, it has been both educational and enjoyable. I have experienced a wide range of activities related to the management and running of a museum environment. On my first day I was introduced to collections management and what Hayle Heritage Centre and Harvey’s Foundry Trust does, I learnt a lot about how museum environments, the qualifications needed to work in one, and the contributions the organisations make to the local community. I was then introduced to the art of object marking. Object marking is used to write accession numbers onto objects without permanently affecting or damaging them, this is done through the use of two solutions and an archival ink pen. 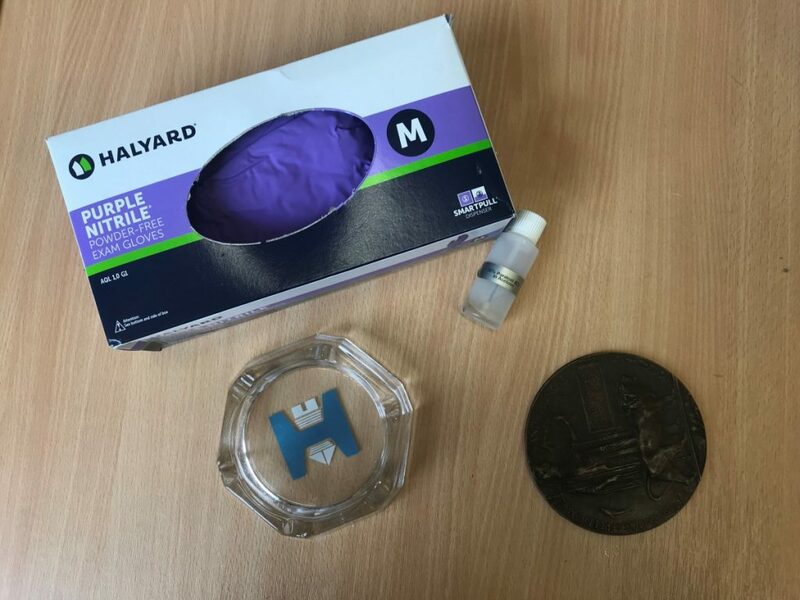 Firstly, you must spread the first solution onto the back of an object and wait for it to dry, once dried you can then write the accession number onto it using an archive pen and wait for the ink to dry before placing a layer of another solution onto the ink. Unfortunately, the process has a heavy reliance on the process of drying and because of the recent hot weather the solution wouldn’t dry properly. Instead, I used another recommended method and labelled the objects using acid-free tags with the numbers written in archival ink. Two objects from the museum collection which I marked. During the afternoon of my first day I received a tour of the heritage centre and the surrounding sites of Harvey’s Foundry Trust, I found that I learnt a lot about the local area from the tour and feel that it was a worthwhile experience. The second day of my work experience started with me briefly marking a couple of objects with tags before I listened to a meeting between the curator and somebody who creates replicas of swords and similar objects, these would be used for an upcoming exhibition at the Heritage Centre, part of which focuses on Hayle in the bronze age. After this I done some brief research on Mesolithic settlements in Cornwall. In the afternoon I wrote a small blog post on Brunel’s connection to Hayle through the viaduct and cables for the Clifton suspension bridge. This was then published on Thursday 19th July which was the anniversary of the launch of the SS Great Western, a ship designed by Isambard Kingdom Brunel. On the third day, Wednesday 18th July, I was introduced to cataloguing objects through the museum database which used a program called ‘Modes’, I was shown how to use this by a kind volunteer who had experience using the program. In the afternoon I catalogued a set of Victorian clothing into the database with the assistance of the volunteer. I found this educational and interesting, it was quite different from what I had been doing for the previous couple of days. It was Thursday when my blog/social media post on Brunel was put out to a positive reception. After this I was marking photographs, this was a lot easier as it just required writing the accession number on the back lightly with a 2B pencil. The new locations then had to be recorded in a log book so that the location field could be updated on the Modes records. In the afternoon I helped with wrapping maps, posters, and similar items in Tyvek in preparation for them being put into the storeroom, after this I then carried on with doing it independently. 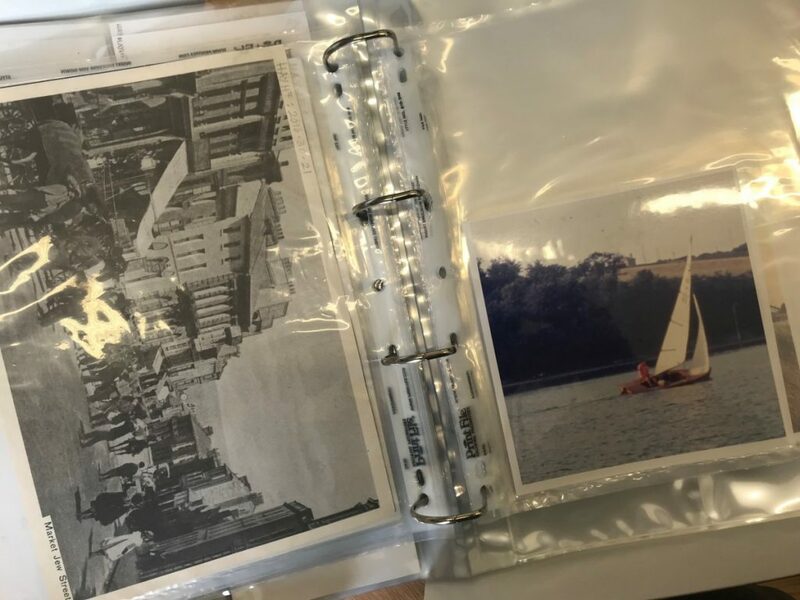 Some of the photographs I marked using a 2B pencil and stored in an acid-free box. 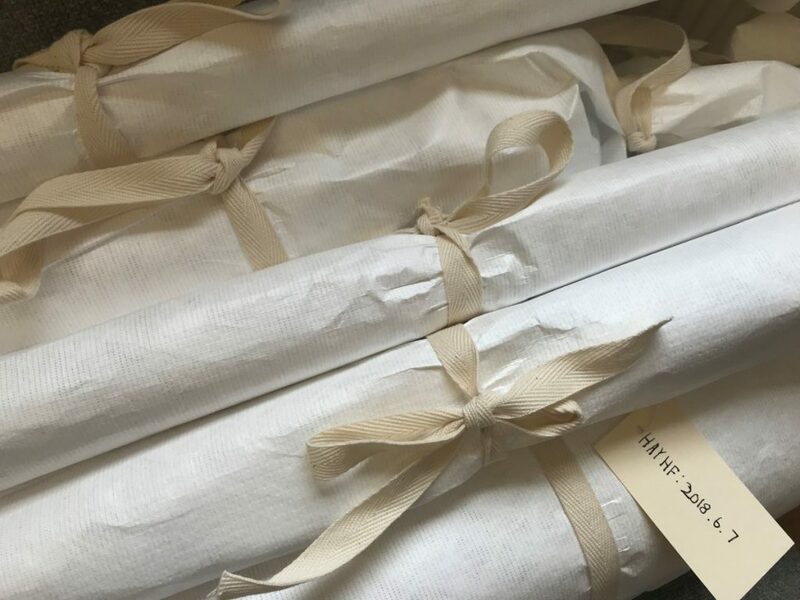 A collection of historic maps and posters that I wrapped using Tyvek and acid-free ribbon. On my last day, which is the day I’m writing this, I started the day by finishing off the maps and similar items from the previous day which I didn’t have time to finish, and then I was taught a bit about Hayle by another kind volunteer who knew loads of fascinating facts about Hayle and Harvey’s. After this I helped with rehousing the collection by storing posters and other items into a box, documenting this into a log, so they can then be stored in the storeroom. After this I started this blog post. 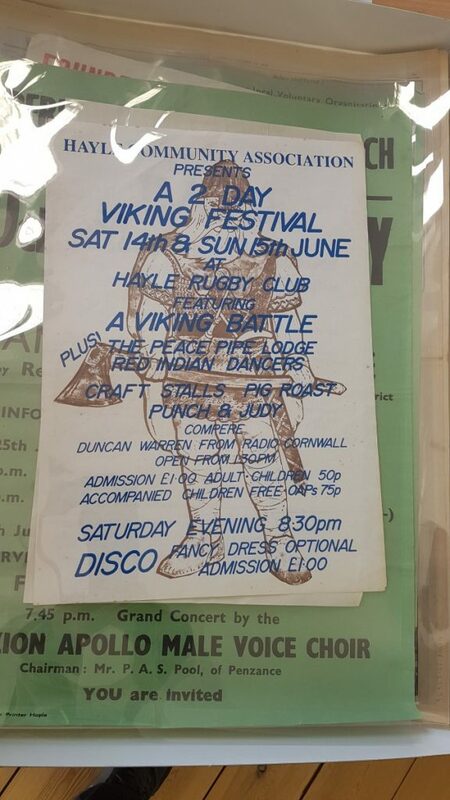 Poster for a Viking Festival in Hayle that I re-housed in an acid-free box in a Melinex sleeve. I have really enjoyed my week and have learnt a lot about Hayle and the running of a museum environment. I thank everybody at Hayle Heritage Centre for letting me carry out this wonderful experience.